few poems in the book. "This is a thoroughly engaging, entertaining, richly rewarding collection of poems by an author steeped in the arts of beauty, the spiritual sounds of nature to a poetic mind and the perfect combination to those who love Rumi and Haiku. Definitely, a must read. ENJOY!" —Michael Browne, an Amazon 5-Star Review. "This first gathering of lyrical works from poet Tim Nonn’s journey into his oncoming blindness is sometimes beautiful, other times astonishingly wise. When he says ‘going blind/is another way/of seeing/the heart clearly,’ he accepts the dare of kinship with Rumi and Basho, Roethke and Bly, a lineage of mystics and, perhaps ironically, seers. His unrhymed quatrains, deceptively simple, are fully armed with axioms: ‘knowing is impossible/you must feel your way/into your heart/and get lost.’ And his mastery of simple means as an approach to the ineffable is always in effect, as when ‘in the presence/of a tree/stillness/is a conversation’ or ‘an evening song/of a bird facing darkness/had the lonely clarity/of one in love with light.’ One in love with the light indeed. 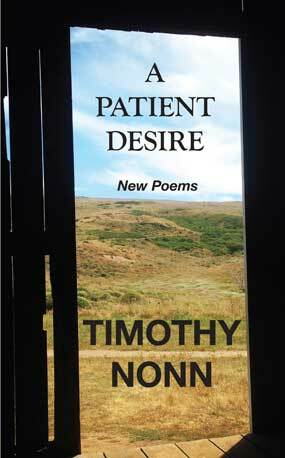 Here Tim Nonn welcomes you and it is likely you will find yourself happily entranced." —William Pitt Root, author of Strange Angels, Striking the Dark Air for Music, etc. /is another way/of seeing/the heart clearly’ and ‘in winter trees/let go of their leaves/trusting the sanctuary/of darkness.’ Trust in Nonn’s leadership and learn to see, and become love." —Armando García-Dávila, 2002 Healdsburg Literary Laureate, and author of Profile: Poems & Stories, and the novel The Trip.